Thinking of Iceland, one envisages volcanoes, geysers, hot springs; all in all a very "hot" Nordic island in the northern Atlantic between Europe and Northern America. One may wonder why it is that volcanism is such a predominant force in this region. mantle plumes i.e. "hot spots"
The first is not relevant to Iceland. It occurs where one earth plate is pushed under another plate, causing earth crust of one plate to slide back into the earth' s mantle. Apart from volcanic activities, these areas are also infamously known for heavy destructive earthquakes and tsunami's. Having said that one should realize that earthquakes are common in all volcanic regions i.e. rift zones, including Iceland. What makes Iceland so unique is that it combines both being positioned above a mantle plume as well as being above a plate divergence rift. Famous mantle plumes lie under the Hawaiian isles and the Galapagos. But many other less conspicuous hot spots have been identified by geologists. Unlike the Icelandic hot spot though, none of these lie above a plate-rifting zone. A schematic figure of the Northern Atlantic. It shows the mid-Atlantic rift pushing the European and North American plates apart and the mantle plume under Iceland. Before going into specific landscapes of Iceland, it is worthwhile to mention the grand scheme of the dynamics of planet Earth, more specifically in the region now known as (eastern) Northern America, the Northern Atlantic Ocean and (north-western) Europe during the last 50 million years. The break-up of eastern North America and north-western Europe was the last page in the formation of the Atlantic Ocean. The split-up between South America and Africa started already some 200 million years ago as the southern super continent "Gondwana" started to split off in the southern continents we know today. But Northern America (Greenland) and Europe (Ireland/Scotland/Scandinavia) only started to split some 55 million years ago (break-up of the northern super continent "Laurasia"). Remnants of these early days can be found in basalt formations at Greenland on one side and Irish/Scottish coast on the other side which were created at the same time. 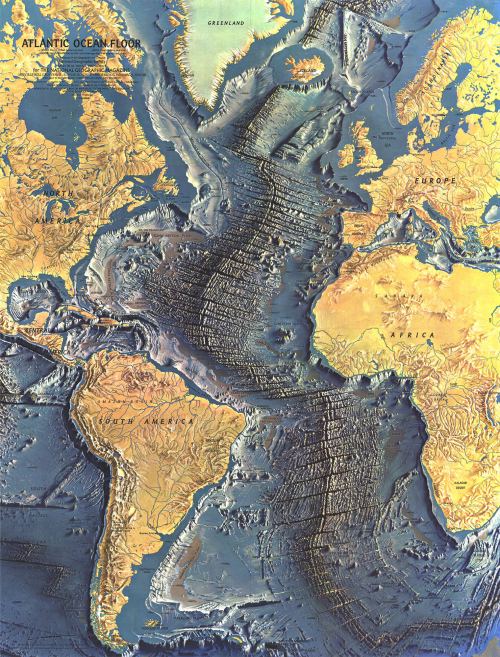 Famous map from National Geographic showing the Atlantic Ocean floor proving the tectonic plate theory. And here comes the hot spot! A hot spot is the region of the Earth crust which lies over a mantle plume. A mantle plume is a upward flowing relative warm mass in the Earth's mantle. This is triggered from the very hot boundary of the core and mantle (the Earth's core is as hot as the sun's outer regions). These plumes are about 100 to 300 km wide. It is believed that these plumes are quite stationary, while plates above slide over the plume. As such a hot spot moves with the momentum of the plate. The Hawaiian isles reflect this as new isles are created as the pacific plate moves over the mantle plume located in that region. The mantle plume under Iceland originally laid under the north of North America. As the North American plate moved in a north-westerly direction the hot spot moved in a south-easterly direction (western Canada, Greenland and finally Iceland). At some point the mantle plume neared the young plate rift that divides and pushes apart the American and Eurasian plates. From Thor Thordasson: the red dots show the movement of the Mantle Plume (or rather the movement of the crust) from present Canada/Greenland to present Iceland during the last 70 mjn years. It is believed that the mantle plume under Iceland is responsible for both ejecting much mass but also causing an up welling of the crust (a bulging force) by which Iceland at large was created. This includes a large area around the exposed land in the sea (see the old NatGeo drawing above). Most geologists believe the mantle plume under Iceland theory to be true. However not all do. 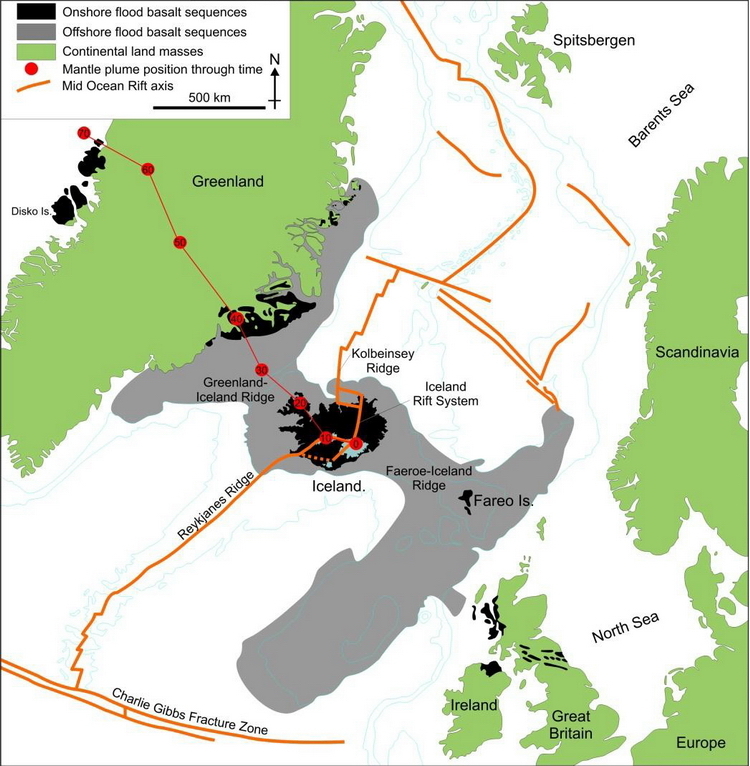 For example, Erik Lundin and Tony Doré from Statoil have proposed a theory requiring no need for a mantle plume to create Iceland at large (see: www.MantlePlumes.org). In the past many other geologists have criticised the concept of mantle plumes too. However, in 20151 an article appeared in the magazine Science by Eric Hand showing results of a sophisticated MRI-like tomographic model of earthquakes showing mantle plumes in the earth's mantle, revealing amongst other a mantle plume under Iceland. Erik Hand states: "(...this ends...) a more than 40-year-long debate".